July 4, 2012 - Boeing projects a $4.5 trillion market for 34,000 new airplanes over the next 20 years as the current world fleet doubles in size, according to the Boeing 2012 Current Market Outlook (CMO) released today. 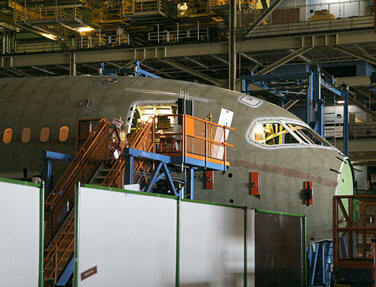 The company's annual forecast reflects the strength of the commercial aviation market. Airline traffic is forecasted to grow at a 5 percent annual rate over the next two decades, with cargo traffic projected to grow at an annual rate of 5.2 percent. The single-aisle market, served by Boeing's Next-Generation 737 and the future 737 MAX, will continue its robust growth. Widebodies, such as Boeing's 747-8, 777 and 787 Dreamliner, will account for almost $2.5 trillion dollars worth of new airplane deliveries with 40 percent of the demand for these long-range airplanes coming from Asian airlines. Freighter Fleet Forecast: 2012 to 2031 - As the cargo market remains sluggish, Boeing has revised downward its projection for freighters over the next 20 years. Still, the world freighter fleet is projected to nearly double from 1,740 aircraft today to 3,200 at the end of the forecast period. Additions to the fleet will include 940 new-production freighters (market value of $250 billion) and 1,820 airplanes converted from passenger models. Large (more than 88.2 tons capacity / 80 tons) freighters will account for 680 new-build airplanes. Medium (44.1 to 88.2 tons / 40 to 80 tons) freighters will total 260 airplanes. No new standard-body freighters (49.6 tons / less than 45 tons) will be required, but there will be 1,120 standard-body conversions.